Sometimes people assume early education is about …crafts. The word makes me shudder. Crafts. Groan. Early ed is about so much more. Crafting is cute, but in my classroom, we do real work. Last year, my class expressed an interest in building. Building with blocks, with Legos, with sticks and rocks. They loved to build and construct with all kinds of materials. In the vein of emergent curriculum, we began a unit on construction. Construction is always fun to learn about because it is so real; so hands-on and sensory. It contains many layers of learning and is something that kids can touch and feel and relate to in their everyday lives. There is some element of it that engages each child, whether the architectural drawings, the big trucks, the engineering of it, the connecting of materials, the purposefulness of it all. Personally, I prefer units that connect with the community around us and that kids can integrate into their lives. As I am in a city school, there is a great opportunity for field trips where we can take the kids to any street corner to observe the cranes and diggers and work in progress. They are fascinated by it. Every morning, they come in with stories of construction they see around them. In this unit, we use real tools. Now, watching a 4 year-old take hold of a power drill is not for the faint of heart. But with teacher oversight and time spent practicing with supervision, kids can usually take on this responsibility. In my classroom, we tend to err on the side of cautious risk-taking. They practice hammering with golf tees into Styrofoam before we bring out the big guns. This unit is only real if we make it real. So this year, after learning that the playground needed a new bench, my classroom decided to take on this commissioned work. Together as a group, the kids decided what materials we needed: wood, nails, tools, tape measure, etc. Would tape and glue work? They concluded probably not. Then each child drew an architectural drawing of what they thought the bench would look like. We even went on a field trip down the street to Harvard to see some cool new benches that had just gone in on campus. I ordered (real) wood from Home Depot and it was delivered to the school. The kids helped unload the wood from the truck – two kids at a time working together to carry the 2 by 4’s down the hall to our classroom. It soon came time to put all the pieces together. 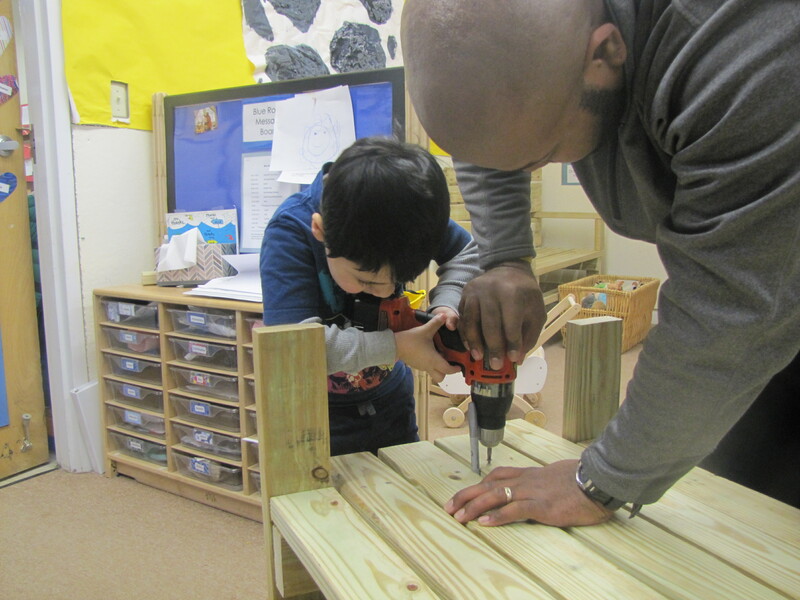 Each child had a turn using the powerdrill to screw the pieces of wood together. It was beginning to look like a bench! Because I’d accidentally bought twice as much wood as we needed, we ended up building two benches and auctioned one off for the school auction; bringing in a substantial amount of scholarship money. The kids understood that the bench they were building was going to be sold for real money that would result in real good. 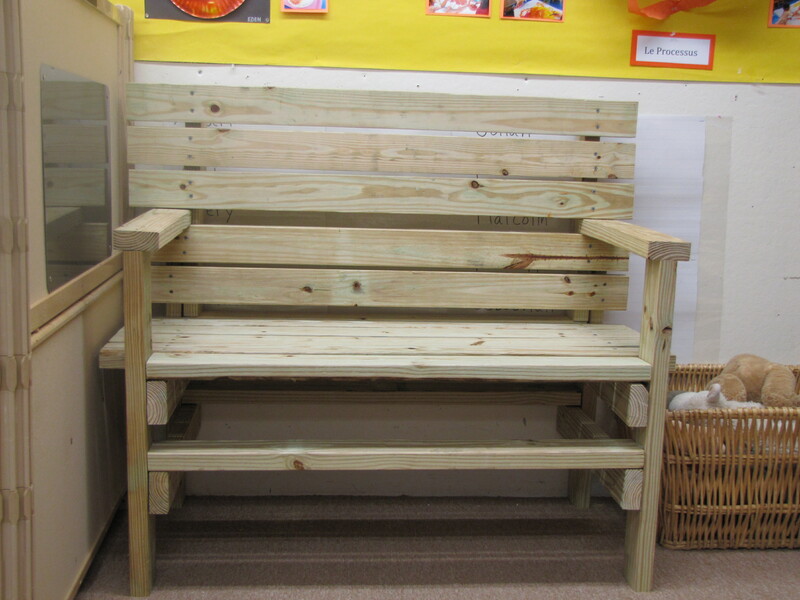 The bench now sits proudly on our playground and groups of children often climb up on it to play or sit and read. And I am so proud to say that my class built that bench. And they really did, from concept to last nail. I so love this! You are the best teacher and the best teaching team. What a great experience and it reminds me to DO and if you can find a way to do this, I am inspired to try ore real world things at home. Marie, Thank you! Julian would have loved this project. I am a believer in real work for kids. They can handle it and can meet high expectations if they are held to them. And yes, I love my team. Whatever would I do without Jermaine? He is awesome too!! You are right – Julian would have loved that project! I can’t wait to tell him about it. Though then I may have to figure out how to do it at home – way beyond my skill set! I also love how you ordered double the wood (cracked me up and I’m sure Jermaine gave you his Jermaine smile) but then figured out what to do. Marie – totally! When I saw the Home Depot truck stash, I knew it was double! oops!